Welcome to the Porsche Club of America’s Werks Reunion Amelia Island. Porsche Club of America (PCA) welcomes all Porsche clubs, owners, and enthusiasts to the Werks Reunion Amelia Island on March 9, 2018, the Friday preceding the Amelia Island Concours d’Elegance on Sunday March 11th, 2018. Werks Reunion was created by the Porsche Club of America as an event to celebrate both the Porsche marque as well as the camaraderie of being an enthusiast. This is not a contest of who has removed dust from the deepest crevices in their Porsche but rather a judged show that rewards a Porsche that has been lovingly maintained and presents itself well on the field. Our judges do not use Porsche Parade Concours score sheets but rather rank the cars according to certain attributes discussed prior to judging. For those who do not wish to have their cars judged, you may display in the model specific corrals or if the organizers see fit, on the judged field itself. There are no score sheets returned or protest committees. This is a casual gathering of Porsche enthusiasts focused on having fun rather than solely competition. Membership in PCA is not required to participate in this celebration of Porsche automobiles. Expect to view a breathtaking array of Porsches at this free-to-spectators event, from rare classics to current models and everything in between. Display your own cherished car in model-specific Porsche Corrals or enter the Porsche Judged field and compete to win in more than 20 prize categories. Porsche owners looking to compete will have the opportunity to enter their car in the Judged event. From original to modified outlaws, our goal is a welcoming event that will dazzle competitors & spectators alike. Judging classes & rules will be available at a later date. Special, one-of-a-kind trophies are being made just for this event. Porsche owners who do not enter the Judged event will have the opportunity to show off their pride and joy in the model specific Porsche only parking corral. This year we have a goal of a stunning display of more than 700 Porsches, access to dozens of vendors, and enjoy the camaraderie of fellow car enthusiasts. 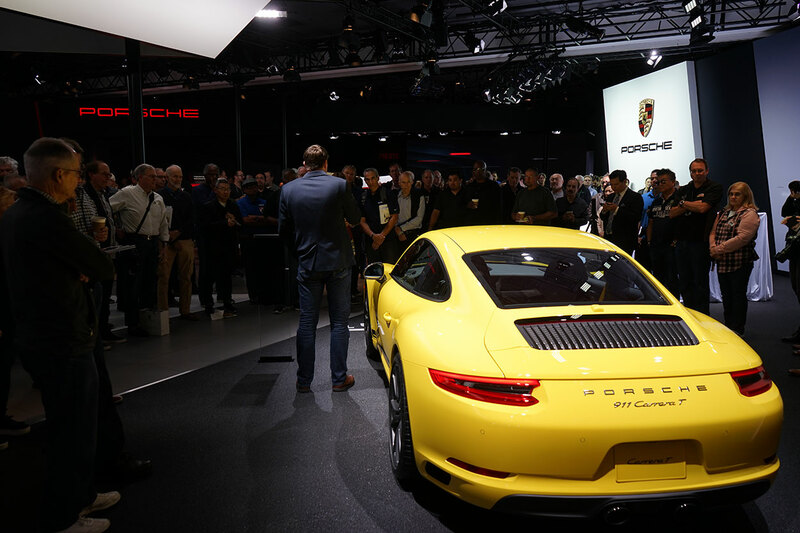 The 2018 show will feature the latest Porsches, special vehicle presentations, celebrity guests, and a surprise or two. Corral Parking (Porsche Only) fee is $50 per car, includes an event goodie bag, reserved parking space, and automatically entered into special sponsor awards. Judged Field Participation (Porsche Only) fee is $75 per car. Also includes goodie bag, reserved parking space, commemorative goodies and and automatically entered into special sponsor awards. To Register your Porsche for the event, go to www. motorsportreg.com. Spectators are still welcome and free to attend. About Porsche Club of America: With over 119,000 members, PCA is the largest single-marque car club in the world. We know the unbridled joy that a Porsche can provide, and have built a community around that very feeling. PCA offers driving experiences, technical assistance, and camaraderie that are second to none. Go to pca.org for more information. Porsche listened to its customers’ pleas when it decided to make the new 911 R that debuted today at the Geneva International Motor Show. It takes the 500-horsepower naturally aspirated flat six from the GT3 RS, pairs it with the chassis and suspension of the GT3 and a six-speed manual, and shows drivers a good time rather than the quickest lap time. Like the 911 R that came before it in 1967, the new one is the lightest in the model line weighing in at 3,021 pounds — a far cry from the original’s curb weight of 1,715 pounds but 110 pounds lighter than the RS. That low weight and high power gets the R to 60 miles per hour from a standstill in 3.7 seconds. You may note that’s slower to 60 than both the GT3 and GT3 RS, presumably due to the time it takes to manually change gears. But the narrow body, little Carrera-type spoiler that deploys automatically at speed, and R-specific rear diffuser all contribute to the car’s balance at 200 mph. Yes, the 911 R is the fastest current 911 and the first to reach the 200 mph barrier since the 997-generation GT2 RS. That’s due to less drag on the R’s clean shape, which is devoid of massive spoilers. One can view the top speed as a byproduct of Porsche’s commitment to give customers the best naturally aspirated flat six it has available in a narrow, simple body because, as Porsche states, the 911 R was built for the corners. One curious bit of technology on this back-to-basics 911 is the rear axle steering system. Apparently Porsche deemed it beneficial to the driving experience despite the extra weight it adds. The 20-inch center-lock wheels are straight off the GT3 and wrapped in the same 245-millimeter front and 305-mm rear rubber. Porsche’s ceramic composite brakes with massive diameters of 16.1 inches up front and 15.4 inches at the rear are standard, lowering unsprung weight while providing more than enough stopping power. It should be noted the six-speed manual features a single-mass flywheel, which is lighter and provides crisper throttle response than a dual-mass unit. It also contributes to a sound that imparts the restless demeanor prominent in the 997-gen GT3 RS: gear rattle at idle. The 911 R distinguishes itself from the Carrera visually with the front and rear fascias from the GT3 plus that prominent rear diffuser. The indented, lightweight magnesium roof from the GT3 RS is also present, while those normal-looking front fenders are actually carbon fiber. Customers may opt for Porsche script on the side of the car below the doors and between the wheels as well as red or green racing stripes that signify the car’s connection to the original 911 R.
Inside occupants are treated to carbon fiber bucket seats with retro houndstooth center inserts. Rear seats are absent. The sport steering wheel is unique to the R, with no rotary dial to adjust engine response and shock settings. 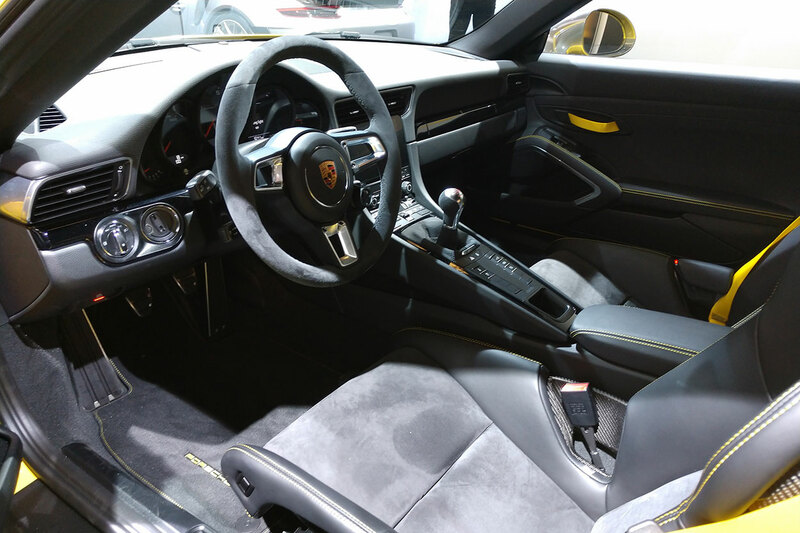 The “Sport” button on the center console, as in the Cayman GT4, does nothing but activate automatic rev matching on downshifts, ensuring a mostly analog driving experience. Standard spec also eschews a radio and air conditioning in the name of weight savings, though they can be added at no charge. Like the GT3 RS, the R features straps in place of handles to open the doors. Porsche says even more sound deadening has been removed from the R, resulting in a bit less weight and more ambient noises entering the cabin (such as the beautiful sounds of the flat six). If you want a 911 R of your own, act fast to secure one of the 991 that will be built — chances are it’ll sell out extremely quickly. Porsche says the 911 R can be ordered now and will reach dealership showrooms in the summer. MSRP is $184,900, excluding the $1,050 destination fee. 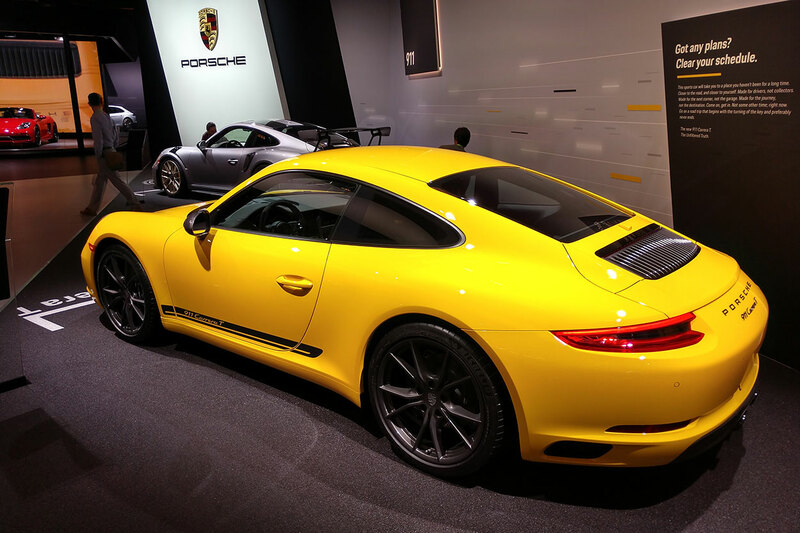 Porsche introduced the new Carrera T on Wednesday at the Los Angeles International Auto Show. The nomenclature may be reminiscent of the 911T, which was the base 911 in the U.S. from 1969-73, but in reality, the designation is where the similarity ends. The original 2.0-liter 911T was the entry-level 911 and it sacrificed a fair amount of equipment (much of it could be added back as options) and about 20 horsepower over the previous 130-hp 2.0-liter base car. While more complexity came with mechanical — and later CIS — fuel-injection, the car wasn’t meant to be a lightweight per se, or a purer statement of the 911 concept, it was just de-contented for the sake of keeping the base price down. The new Carrera T is something altogether different, in some ways more in keeping with what the 911 Carrera Club Sport was in the 1980s. 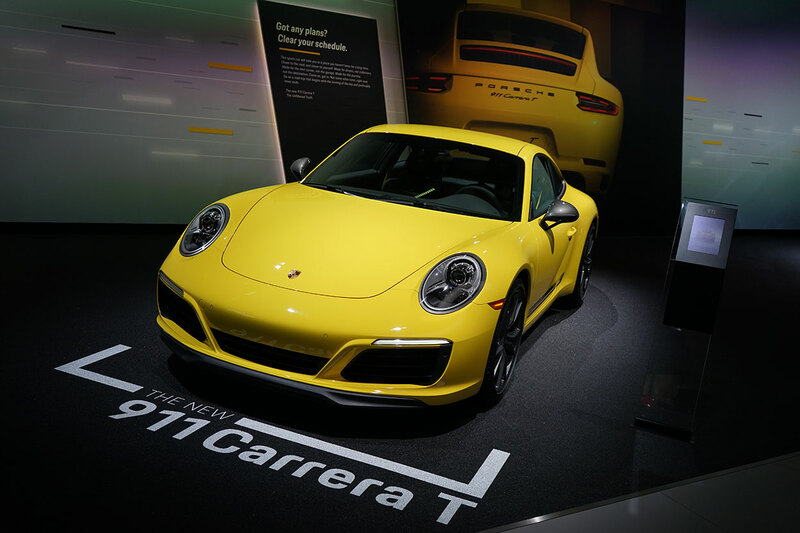 While Porsche may say “less is more” the Carrera T still delivers a healthy 370 hp and is combined with a specially lowered sport chassis with Porsche Torque Vectoring (PTV), Porsche Active Suspension Management (PASM), and available rear-axle steering not available on the base Carrera. A sport exhaust system is also standard. Like the old Carrera RS 2.7 and 911 Carrera Club Sport, the T’s door panels are simplified, with cloth loops utilized to close the door. Rear side windows and the rear window itself are made from thinner glass. It saves about 11 pounds or so with the car’s total weight now coming in at approximately 3,142 pounds — though European Carrera Ts are about 45 pounds lighter than a base Carrera with no options due to different standard equipment levels. In Rest of World cars, Porsche Communications Management and rear seats are eliminated as standard, while in North America they are included. Opt for the bucket seats and rear-seat-delete, and the weight reduction will be closer to the RoW car. A 7-speed manual transmission is standard with a 7-speed PDK optional. 0-60 miles-per-hour times are quoted by the factory as 4.3 seconds for both, with a top speed of 183 mph. I heard a bit of carping from some journalists over the Sport-Tex cloth seat centers that are standard on the T. I rolled my eyes. Cloth is grippier and remains comfortable without resorting to ventilation, and frankly, Porsche has a history of doing very stylish cloth seats. Whether in hounds tooth, Porsche script, pinstripe, tartan, or Pasha, cloth has always been part of the 911’s interior design language, even if US-spec cars seldom saw it. As a fan of the original Carrera Club Sport from the early 1980s, I find the Carrera T to be an appealing car that I suspect will be far easier to live with than lightweight 911 variants of the past. The Panorama team is anxious to report further after getting behind the wheel of what Porsche is calling the “unfiltered” version of the 911. The electric sedan was unveiled at the Frankfurt International Motor Show in September and will have more than 600 horsepower, an 800-volt charging system, and a range of 310 miles, putting it squarely in the territory of today’s Tesla Model S sedan. To accommodate production of the EV, Porsche says it will invest “around 700 million euros” into its headquarters at Stuttgart-Zuffenhausen and add more than 1,000 new jobs. A new assembly plant and paint shop will be built, and the current body shop will be enlarged. The existing engine factory also will be expanded and equipped for electric motor production. Porsche mentions that its Weissach development center will receive similar investments. While Mission E does not exceed the Model S P85D’s power output and roughly matches its range, the 800-volt charging system promises to replenish 80% of the lithium-ion battery in 15 minutes. 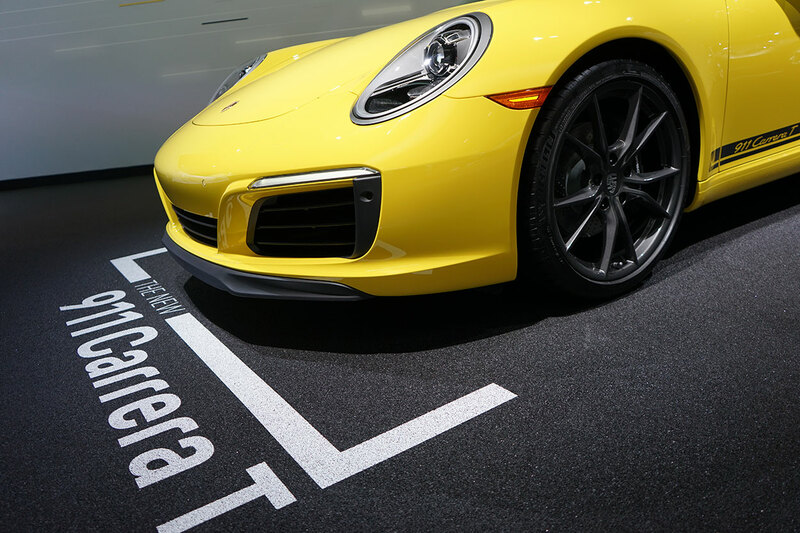 Porsche claims it is twice as fast as today’s 400-volt quick-charging systems.